Follow H. Samuel to get news updates and products on your homepage. H. Samuel is being followed by 2 people. H. Samuel has 164 stores in the UK in our database. H. Samuel is currently ranked 293 in the directory. Last month its rank was 72. 2 people have saved H. Samuel to their MyShops list. 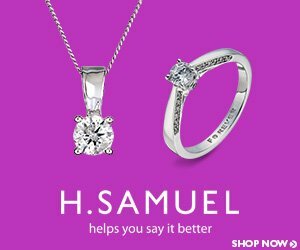 H. Samuel Sale & Offers! Valid until Friday, 24 Apr 2020. 96 products added to H. Samuel 4 days ago. 388 products added to H. Samuel 8 days ago. 104 products added to H. Samuel 11 days ago. 242 products added to H. Samuel 15 days ago. 75 products added to H. Samuel 18 days ago. 110 products added to H. Samuel 21 days ago. 677 products added to H. Samuel 29 days ago. A Special Offer was added for H. Samuel: H. Samuel Sale & Offers! 40 days ago. 9468 products added to H. Samuel 45 days ago. Updated The link H. Samuel was updated 60 days ago.